The ever versatile Sanpellegrino Limonata is transformed into one of our signature mocktails: Gingermore. Bring to the table the fragrant lemon groves of Sicily with this piquant drink that’s been the missing link to your zesty meal creations and any festive occasion with your favorite people. 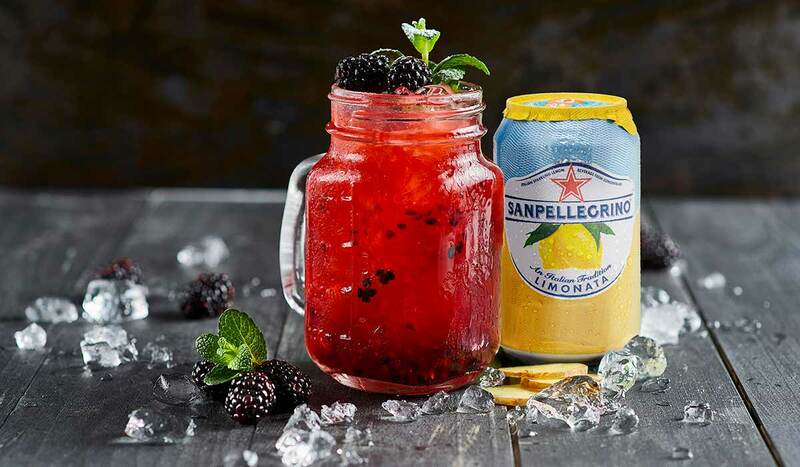 Carefully muddled blackberries and ginger are topped off with refreshing Sanpellegrino Limonata making it an invigoratingly crisp drink that is tantalizing on its own, but will have you craving to be by the street food stalls in your favorite town in Italy. If this is unrealizable, try our suggestions instead – enjoy the Gingermore with a cone full of supplì, pick through some stuffed zucchini flowers or pick your own from our Zesty Food recipes. In the bottom of a sturdy, large glass (14 oz capacity), muddle the blackberries and fresh ginger. Fill the glass with ice cubes and top with Sanpellegrino Limonata. Gently stir together the ingredients using a bar spoon. Garnish with lemon peel, blackberries and fresh mint. If you are 21 years old or over you can turn the Gingermore into an alcoholic drink by adding 1 oz of vodka.